Barely two weeks into his ill-gotten presidency, Donald Trump has made such a mess of things that public support for his impeachment has already reached a higher level than at the height of Richard Nixon's Watergate scandal. With scandals and disasters too numerous to mention, Donald Trump's nascent presidency is the very definition of embattled. And according to a new poll from Public Policy Polling, the short two weeks of Trump's reign have taken a drastic toll on his already-dismal popularity. Less than 2 weeks into Donald Trump's tenure as President, 40 percent of voters already want to impeach him. That's up from 35 percent of voters who wanted to impeach him a week ago. Only 48 percent of voters say that they would be opposed to Trump's impeachment. There is a sharp partisan divide, but the 40 percent who favor impeachment include 10 percent of Republicans and 38 percent of independent voters, which is higher than President George W. Bush's entire two terms, where support for impeachment over Iraq WMD's peaked at 36 percent. Despite virulent and persistent opposition, support for impeaching President Obama peaked at 29 percent, and for President Bill Clinton, who actually was impeached, it peaked at 40 percent, but 60 percent agreed with the decision not to remove him from office. 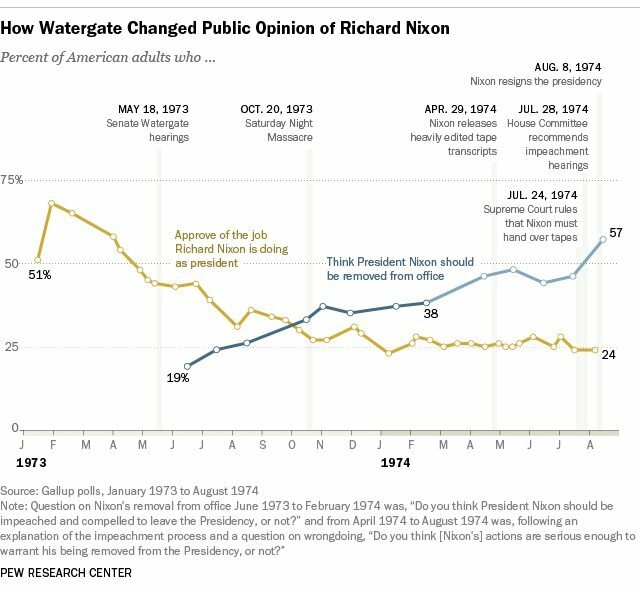 Support for Nixon's impeachment reached 44 percent in May of 1974, after Nixon's televised defense of his refusal to surrender evidence in the Watergate probe, and just three months before he would resign. Trump faces the possibility of impeachment on multiple grounds, and these results demonstrate that if anything develops with regard to Trump's Russia ties or business conflicts, the American public stands ready to watch him leave office in disgrace — much more so than they cared to watch him assume it.